My client moved into their 1980s home more than 10 years ago, and hired us to make décor changes to their living room and bathroom. The kitchen was left untouched. The large space takes up a quarter of the home’s main floor and includes an eat-in dining area. It features tall ceilings, granite countertops and custom-made cabinetry with plenty of storage. At first glance it’s a beautiful space, but somewhat dated. So, the homeowners brought us in again to take care of the roosters, grape vines and wallpaper borders. 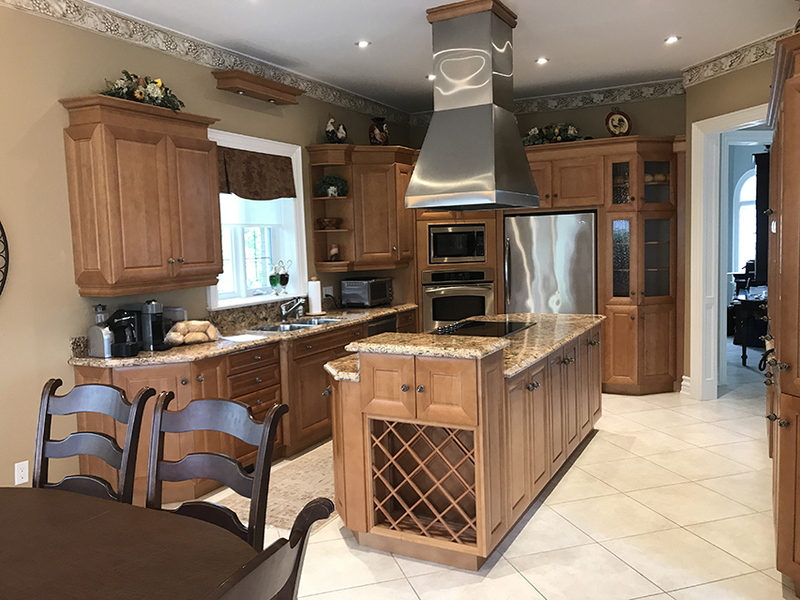 But this kitchen needed more than a décor update; we learned it was a dysfunctional space with a problematic layout. 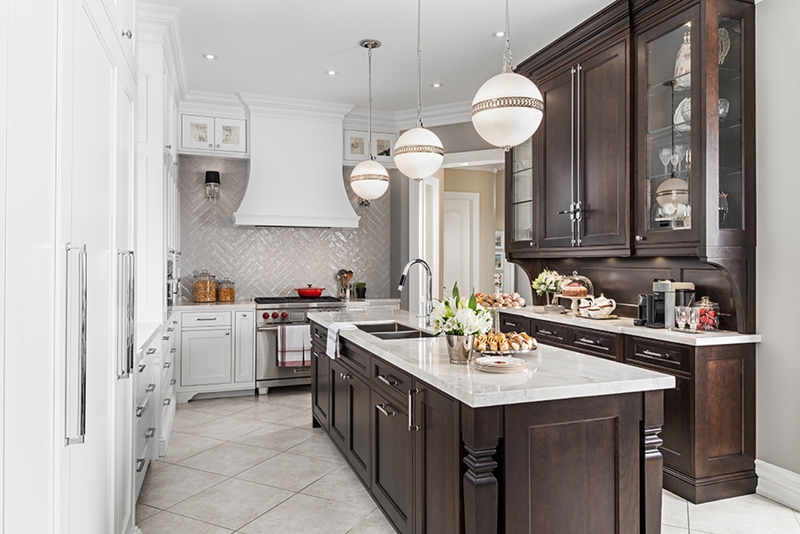 The range hood over the island in the centre of the room looks impressive, until you have to work under it. The homeowners are of average height, but the hood presented a hazard if you were to lean forward. The raised part of the counter was meant to accommodate a small cupboard over the wine rack, but it broke up the expanse of counter space and the cupboard went unused. The narrow walk space between island and sink meant only one person could be in the space comfortably at a time. There were issues opening the garbage door under the sink or washing dishes while someone was at the stove. For a large kitchen, it had a lot of restrictions. The stacked, built-in oven and microwave in the corner wall looks very practical, until you have to get something out of the fridge while opening the oven door. You can’t do both at the same time. For all the built-ins and spacious pantry cabinets (with coffee bar), the toaster oven had to sit on the counter, taking up space. The space in general was in good enough shape, so it didn’t require a renovation. The plan: keep the floors, update the lighting, keep the dining area, repurpose or donate the cabinetry, fixtures and appliances, and rework the function of the space. 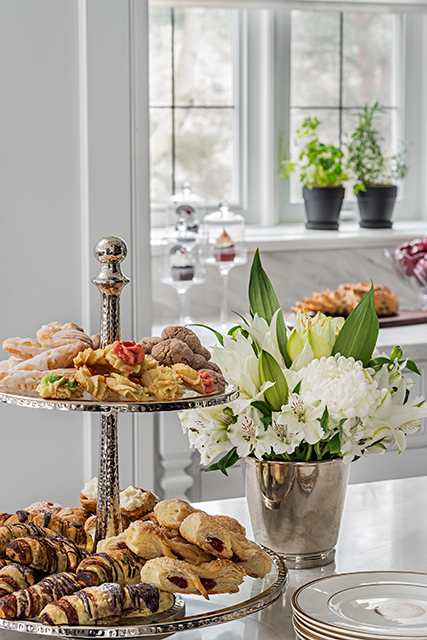 We started by drawing new plans to address every complaint or pet peeve about the kitchen’s function. We proposed repositioning the major work areas and banishing the work triangle. Yes, the work triangle was a very practical concept when kitchens were built for efficiency. Three work areas were needed: refrigerator, stove/oven and sink. Counter space was not a big consideration because it was only used to prep one meal at a time, not as an area for entertaining. Today we work with zones: storing, prepping, cooking, serving and cleaning. 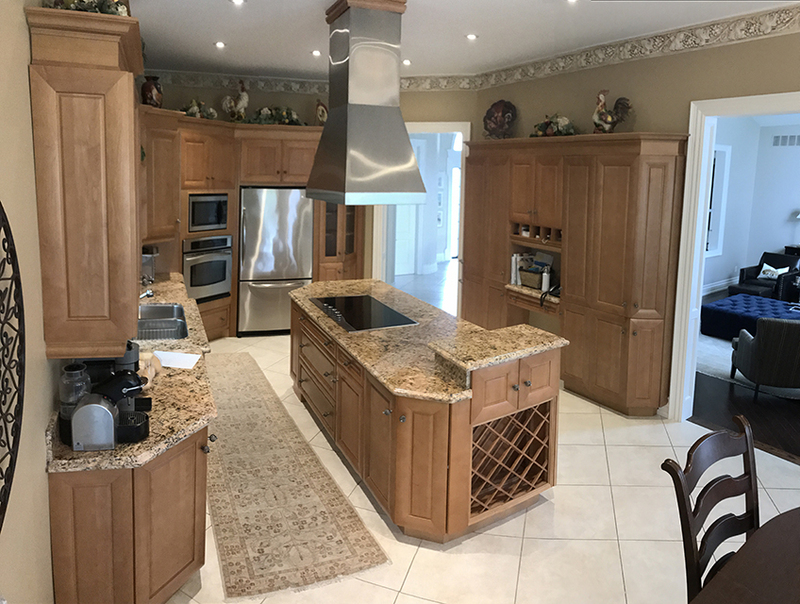 Working with custom cabinetmakers, Downsview Kitchens, the new layout works well for more than one function (or person) at a time. The cooking surface commands its own presence, with the Wolf range and cooktop and impressive, curved range hood set against the shiny-tiled, chevron-patterned backsplash. The sinks were moved to the contrasting dark wood island. The built-in fridge, paneled in the same crisp, white cabinetry, blends in and has enough space around it to function well. 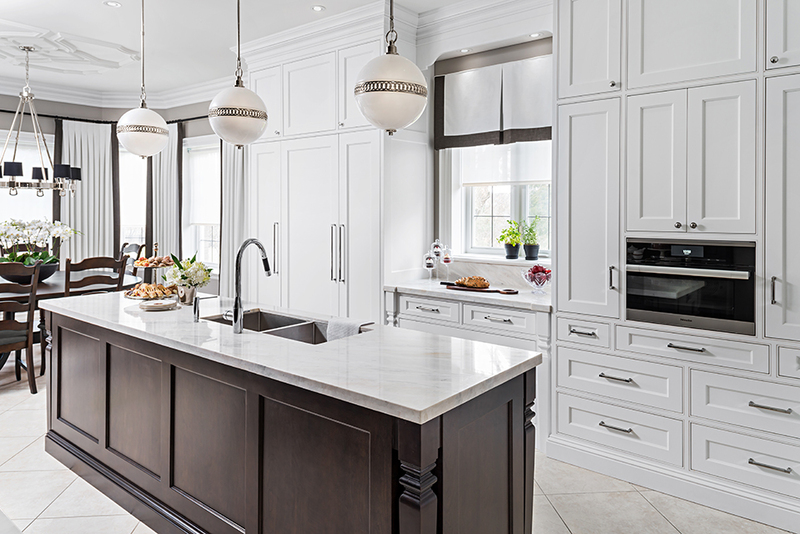 The servery’s contrasting dark wood tones add a French Bistro feel, especially with the classic touch of the Cremone Bolt detail. To ensure function with multiple people working in this space simultaneously, we reserved a drawer in the island away from the sink for the garbage and recycling. 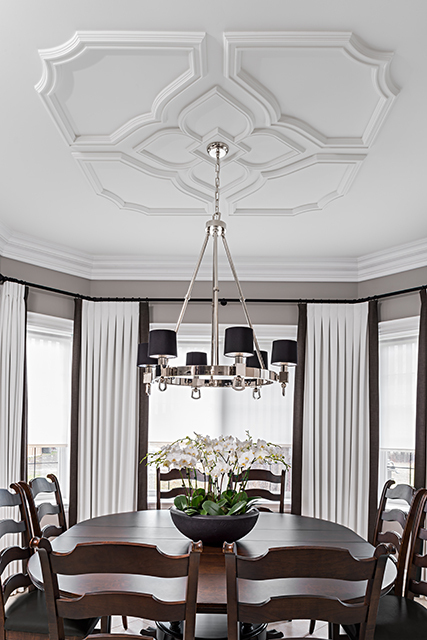 Finally, the dining room ceiling received new decorative trim and custom, tailored drapery to complement the new kitchen. Now, the roosters have flown the coop and this kitchen functions better than ever.